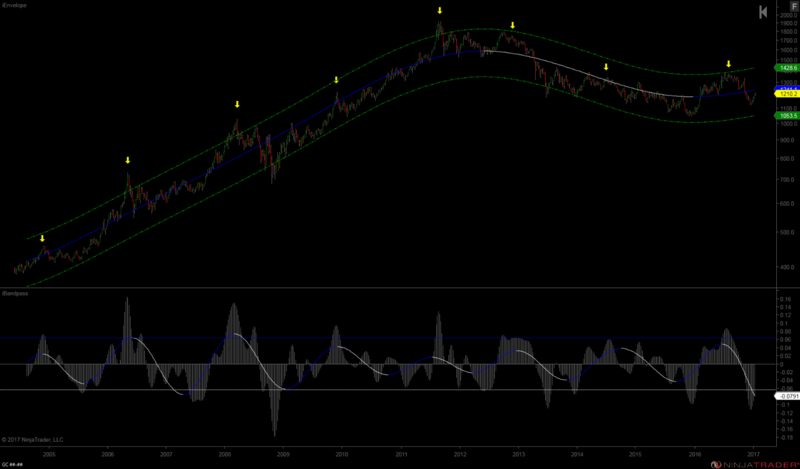 Gold is always interesting to analyze for a couple of reasons. Firstly, the viewpoints of the participants are usually at polar extremes, the inflationary group that says gold is going to $5000/oz. and beyond, and the deflationary group which is forecasting sub $1000/oz. again. Secondly, gold has a very consistent spectral structure which makes it one of the easier(?) instruments in which to trade or invest. The first chart below is a monthly chart of the non-back adjusted continuous gold futures contract covering forty two years of price history. Gold exhibits a characteristic that is common to commodities, that being the price waves have a strong tendency to phase to the highs. The price wave shown at the bottom of the chart averages approximately 92 months measured from the 1980 cyclical high to the 2011 cyclical high (slightly longer if measured using absolute highs). The price wave phases very well to visually evident highs in the price action. In addition over the past thirty years the wave has been subject to only a moderate amount of amplitude modulation resulting in reduced deviations from the average period of the wave. Some analysts have suggested the existence of a 15 year price wave as noted by the red dots at the highs. The envelope represents a rough approximation of the trend underlying such a price wave. 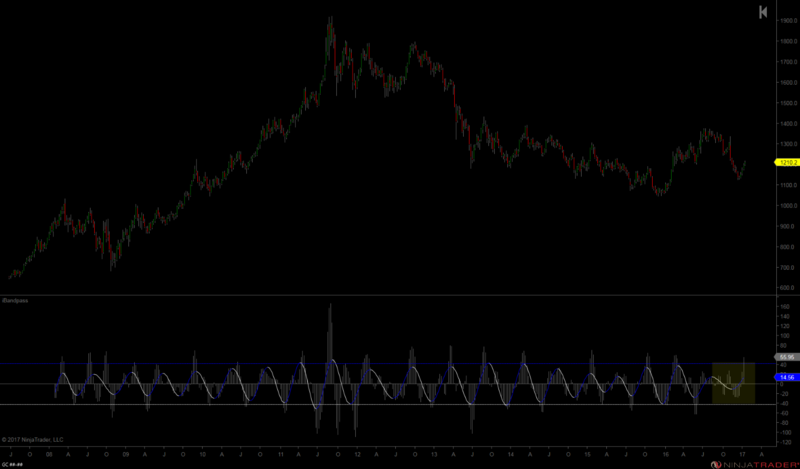 I prefer to see at least three oscillations before labeling it a price wave. The chart below is a weekly chart of the same gold futures contract. The price wave depicted at the bottom of the chart averages approximately 87 weeks over the last decade. It also is very dominant with peaks phasing to visually evident price action highs (yellow arrows). As with the 92 month wave, the amplitude modulation is moderate resulting in consistent oscillations. The constant width envelope is an approximation of the sum of all price waves 92 months and longer. It is fairly obvious that in order for the uptrend out of the December 2015 low to continue, the price action needs to establish a higher 80 week high. The chart below shows the very consistent 20 week price wave (approximately 23 week average). The last few months it has been subject to a magnitude-duration fluctuation (yellow area) with makes its current status somewhat tenuous. However, due to the fact that gold decomposes into its dominant price waves so consistently, the shorter price waves (not shown) are tracking the current price movement perfectly, ensuring that one stays on the right side of the trade. Whether one is a long term gold bug or a short term trader, from a cyclical viewpoint, gold provides a very consistent vehicle for entering and exiting positions with a high probability of profit. 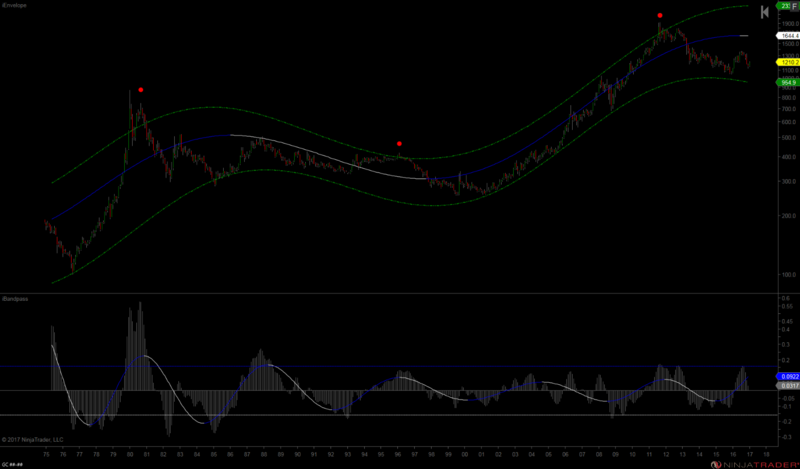 Could you please also analyze Crude Oil Continous Chart under you standview of amplitude? ← 30YR US T-Bonds : The Big Long – Is it over?